Visit the Glessner House Museum and enter the world of Gilded Age Chicago. Following the Great Chicago Fire of 1871, Prairie Avenue became the place for the city’s elite. 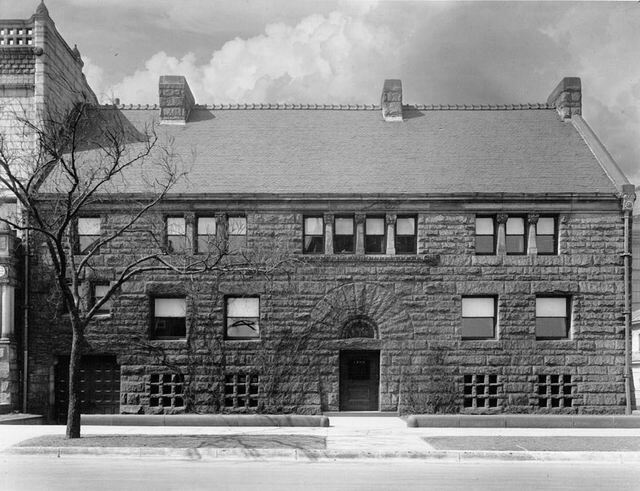 The Glessner House is all that remains from this famed time and place. We welcome all visitors to come explore urban life and design through the preservation and interpretation of the architecture of Henry Hobson Richardson and the historic home of John and Frances Glessner. We are proud to offer guided tours of the Glessner House (1886), a National Historic Landmark and Clarke House (1836), Chicago’s oldest surviving building located in the adjacent Chicago Women’s Park and Gardens. Tours are led by trained docents and last approximately one hour in each house. All tours begin at our Visitor’s Center located at Glessner House Museum and are timed so that the two houses may be toured back-to-back. The Home is open to visitors year-round, except for major holidays. Our calendar keeps you current with the special programs of the Glessner House Museum. November 7: The new house is being roofed – the outside brick work is done – and nearly all of the stone work. The glazed brick is being set inside the house and barn. A woman asked Mr. Cameron (construction supervisor) in our house last Sunday if Mr. Richardson was dead. When he said “yes” she said, “I guess this must have killed him. December 5: I have been ill all the week . . . I have only been once out of the house since and that was to go to the new house yesterday – where I went up stairs for the first time. The house is most beautiful and attractive in every way. December 12: John sent me a hurried note asking me to send the carriage to the Richelieu after Mr. and Mrs. (George) Shepley. We arranged to call for them the next morning and take them for their first view of the house. They were in raptures over it. Mr. Shepley said we were the first clients he ever envied – but he would like to live in the house. We left the carriage at 16th St. and walked down to look at it. We took down champagne and Italian bread to christen the house and have our first meal there. NOTE: Architect George Shepley took over supervision of the construction of the house following the death of H. H. Richardson in April 1886. Explore the archives of our newsletter to read more about our collections and Mrs. Glessner’s journal.